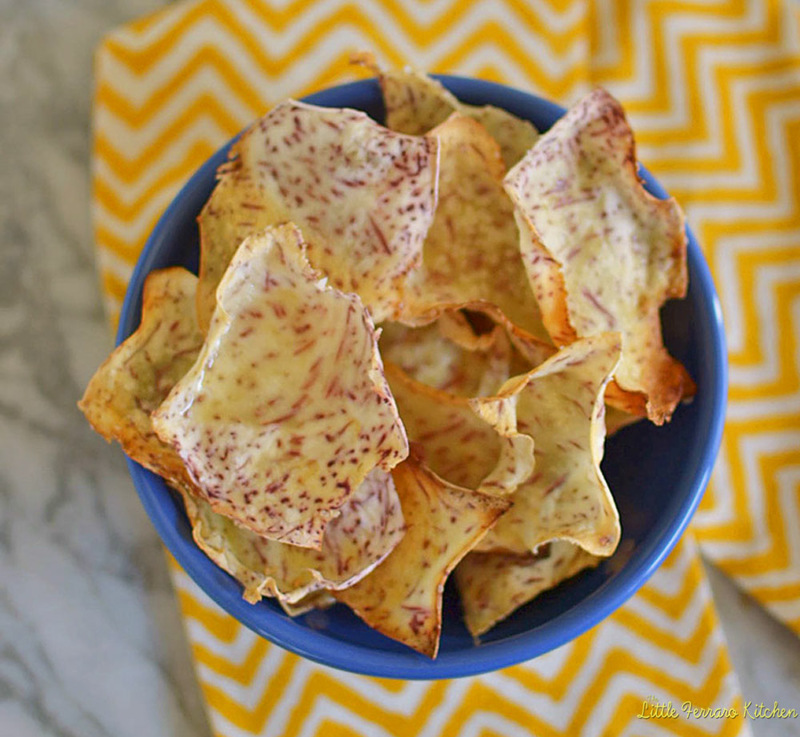 Crispy and baked homemade taro chips are so easy to whip up! First of all, I need to give a HUGE shout out to my girl, Kita from Pass the Sushi. 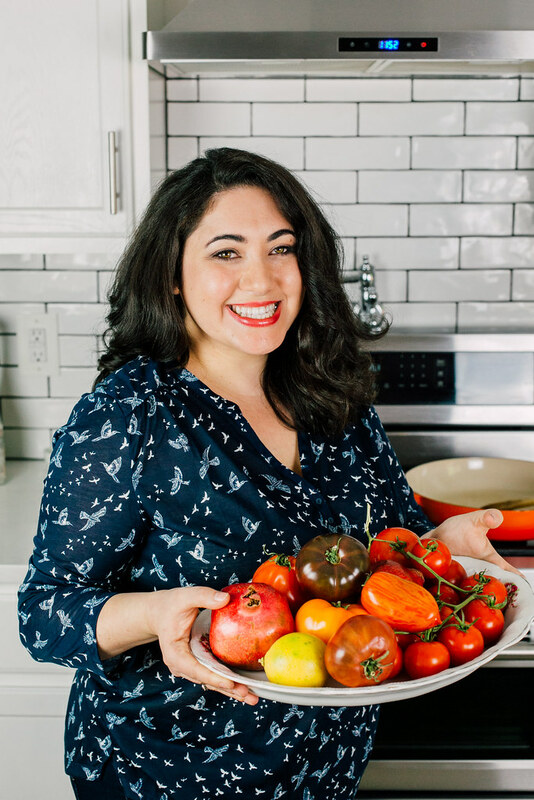 She is the mastermind of all things technical with my blog and a total life saver. I have been freaking out and holding off on some deliciously post-worthy foods because my photos were not Pinning! Good grief! And if you’re a blogger or in any way obsessed with social media, you know that not being able to pin your images is a catastrophe. So alas, a..million and one emails back and forth, it looks like it’s working and ready to rock! You have no idea how bloggy-happy I am right now. So get ready and go pin crazy! There are a few things I miss from living in Hawaii. #1), my mom who just left a few days ago after spending a week for my graduation. #2, lilikoi aka passion fruit. And #3, taro chips. Taro is a staple on the islands and my step-dad actually harvests the root right in their backyard. Check out the pictures here and for the recipe for taro and coconut. After a trip to our favorite Asian market, I couldn’t wait to slice up this purple root vegetable. And it couldn’t be easier. I used one of my favorite tools, the mandolin and put it on setting 2 and sliced away. It’s really starchy so be careful with your hands getting a little slippery and starchy. If you're using a mandolin, put on the lowest setting 1 or 2 and slice the taro lengthwise. Don't rush this step and watch your fingers as you slice. For parts that are too small to slice with a mandolin, use a sharp knife. Place slices on parchment paper lined baking sheets and brush each slice lightly with olive oil. Bake in 400 degree Fahrenheit oven for 20 minutes until edges are crisp. Season with extra salt if desired. Love love love taro!!! 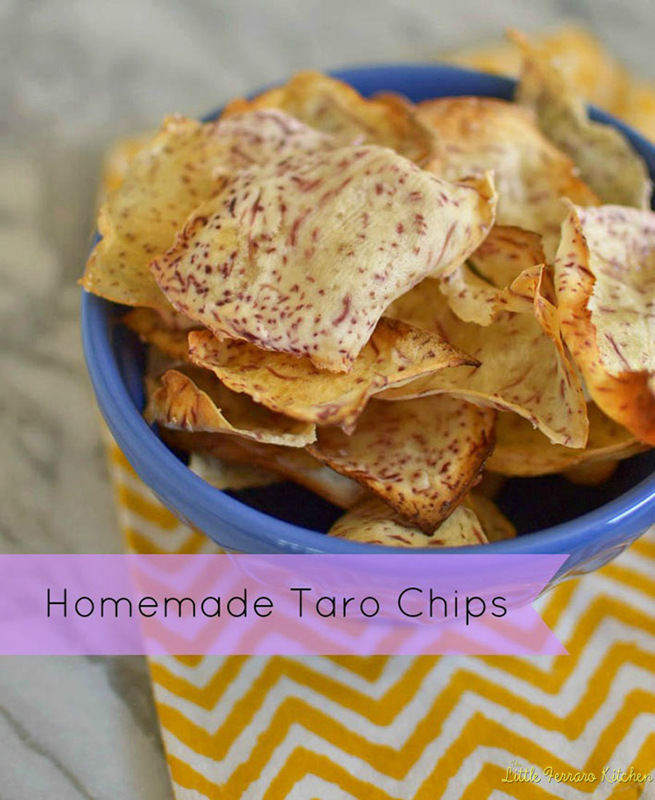 I had many taro chips, but never thought to make my own. Your recipe sounds very easy with only a couple of ingredients. There is no reason for me not to try this. Thanks! I wonder if they could be made with something like Pam instead of oil? I love passion fruit – I purchased some lilikoi jelly the last time I was in Hawaii and loved it! But I’ve not had taro yet. I love the idea of these chips!! I don’t know if I can get taro root here in CA or not, but I’m going to look. We also have some good Asian markets here. The chips are gorgeous! I tried taro for the first time in China last year and absolutely loved it. 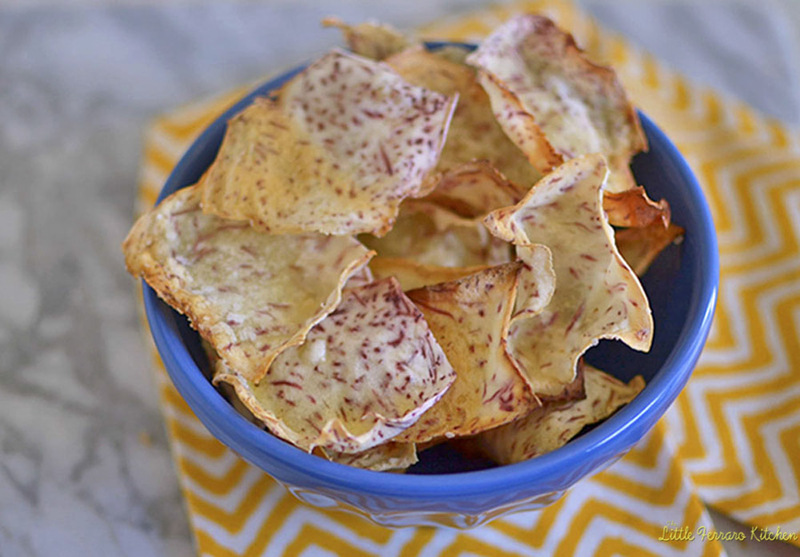 I would love to make these chips and can’t wait until I have an oven to make them : ) Do they need to be flipped over halfway through the baking process? Good point on step 2 in the directions — I’ve gotten the WORST cuts on my fingers when rushing through the mandolin slicing, you really have to go slow! I don’t remember flipping them..I dont think you need to because they are cut so thin. The edges did crisp up and the middle was a little less crisp. They wont be super crispy like fried ones but I still loved the texture! Can you make a large quantity of this stuff and keep for days in an airtight container? You can, but I don’t think they will stay crisp that long..maybe a day or so. Though, you can re-heat them in a low temperature oven for a bit and that may help crisp them up again. I know this is an older article, but I made these today and they are delicious! However, I’ve only eaten a couple, because I was reading the Wikipedia article about taro while eating them, and saw that it’s toxic and needs to be soaked before eating. After that I scoured all the online recipes for chips, and only one made any mention of it, and then only ‘it may be a good idea to soak them first so they don’t make your throat itch’. These haven’t made my throat itch, but now I’m scared to eat them! Any idea if soaking was a crucial step that’s just not mentioned in recipes? Thanks! Hi T! Funny, I’ve had taro a million times and never had that weird feeling? ?Though I never had raw taro and I wonder if the raw does that? My stepdad cooks with taro all the time and I don’t think I’ve ever seen him soak it before? I’ll have to ask him and look into it some more, but so glad you liked the recipe!! Do you know how long they’re good for? Thinking of making a bunch and then storing them as snacks! Hi Julie! I think theyre good for 2 days but probably won’t stay as fresh and crisp as right out of the oven! It’s so easy to make. Do we have to soak the taro beforehand to make it more crispy? I haven’t soaked the taro before, but it couldn’t hurt and I bet would make for an even crispier chip. Any taro tortilla(like highway inn serves) recipe and how many calories would you say it would be?